So y’all know RancherMan & I changed up my garden this year. We split the garden almost in half and integrated the chicken coop and run into one half, my vegetable garden into the other half. We ripped up the raised beds we had built in there since Bermuda grass would simply grow into the garden from the outside of the garden fence and under the raised bed boards and into my veggie patches, where it was almost impossible to remove. I fought (and lost the battle) against Bermuda grass every year. If raised beds are going to be a problem we will just go with rows from now on. RancherMan tilled the area last fall, and had tilled several times since then to chop up any vegetation. I raked and raked to get out as much of the grass runners as I could. But how will we keep that Bermuda from coming in through the perimeter of the fence? I decided to make a walkway around the entire perimeter of the garden. I’d line the area first with paper feed sacks RancherMan has saved for me since last year so that nothing will try to grow there. Then I’ll top it with bark mulch to make it look nice as well as give me a walking surface. But I needed a cheap (or even FREE) source. So in desperation I contacted our county extension agent (she’s great by the way!) . I told her when we lived in a Dallas suburb, the city had a location where residents could come pick up mulch and wood chips for free. It was beneficial to the city not to have to haul that botanical matter to the landfill, beneficial to the residents to be able to use that material. And it was also beneficial to both city as well as residents in water reduction since compost conserves moisture so well for gardens. I was not aware of any such service in our county. But I was in luck! The extension agent said there was indeed such a service in our county located at a nearby city park. The place in the park where they stored the wood mulch was unmanned. Residents simply pulled in next to the wood-chip pile and filled up their buckets or the beds of their trucks and it was all FREE. So RancherMan & I loaded about seven large empty 200-lb cattle protein buckets into our truck and headed to the park. 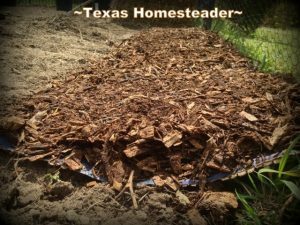 Free Wood Mulch, No Plastic Bags! Now I knew this park was here, we’d passed it many times before. But we had never actually stopped in. It was a lovely place! And the beautiful sunshiny day meant there were families with their kids all enjoying the park. They were having picnics, playing Frisbee or feeding the ducks at the pond. Lovely! We’re going to have to bring our grandbabies here soon! In no time RancherMan & I had all our buckets filled and headed back home. 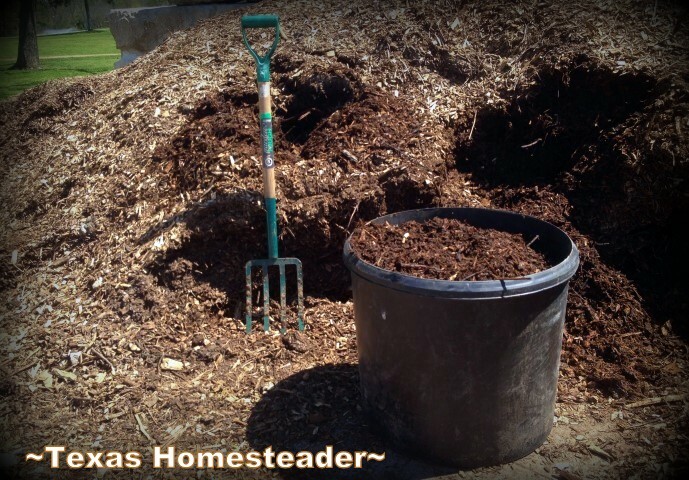 In all, it took a total of 14 buckets of bark mulch to thickly line my garden in an 18-inch strip. It took another 7 buckets of bark for the 18-inch rows between my planting areas. We’ll probably go one more time and fill the 7 buckets so I can thicken the mulch on the walkways. But I love that I used items that would otherwise go to waste: The paper sacks were just a waste byproduct of our cattle feed. And the bark mulch is a natural material that will degrade over time and be mixed back into the garden soil in subsequent years. I’ve used plastic (almost against my will) to line the garden in previous years. But the plastic didn’t allow rain to percolate into the round and the ground ended up soured over time. The paper should allow slow percolation of rainwater. It also will degrade over time and be mixed back into the garden soil. In the meantime, the earthworms will love it, which also will improve my garden soil. SCORE! Purchased Bark Mulch Is Expensive, And WASTEFUL! As it was, all it cost us was a couple of pleasant trips to a nearby park and our time – no plastic trash! As I said before, it was a good thing for us financially, a good thing for the environment and a good thing for the city to not haul this precious material to the landfill. The moral of the story is this: Check with your city (or county) and don’t assume your only option is to buy this stuff! Many cities have similar services so check with your city, utility companies or call your local extension agent. As it was in our case, it can be a trifecta win for you as well! 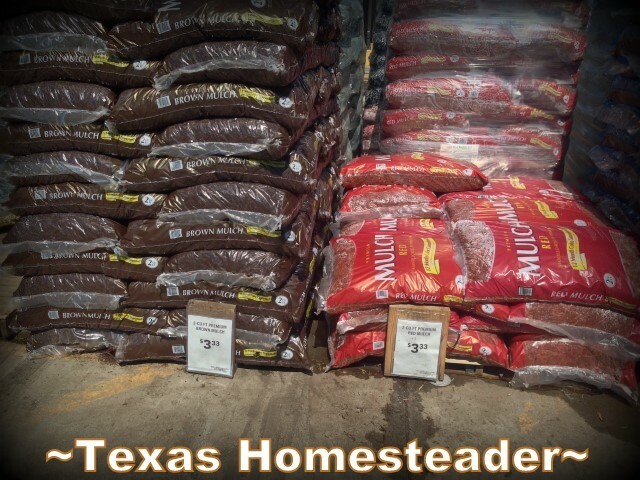 This entry was posted in Blog Posts and tagged Environment, Frugality, Gardening, Spring on April 15, 2016 by Texas Homesteader. Great Share Tammy, I knew this but never occurred to me to share it. Your rocking girl…. Good Job …Great savings for all who need this medium. Tammy, is that in Hunt County? Hi. 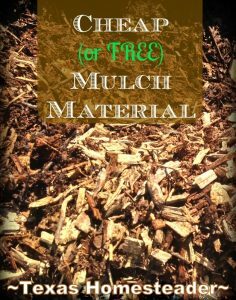 I live in Washington State and I found a free mulch source as well. Thank you for encouraging your readers to do this. I enjoyed reading your post! Awesome job! Fortunately we took a class about gardening from a local couple who pointed us to a local garden store that had bulk mushroom compost and told us about some tree cutting services that allowed you to pick up wood chips from them for free. We also lucked out and happened across a tree cutting company that would deliver for free! All those bags of mulch add up to a lot of waste! Thanks for sharing on Let’s Get Real Link Party. Will be pinning. What a great post. My local recycle center offers free mulch! I am really grateful and so is my garden. I really enjoyed your post! Thank you! It is wonderful that you were able to find mulch for free. I’ve never found it free (though I’ve honestly not looked very hard) but we are able to purchase it from a semi-local landfill, and they load it into our dump trailer for us, for something like $40 per trailer load. I love how tidy it looks, and how it is adding biomass to my garden.